Ow My Balls! 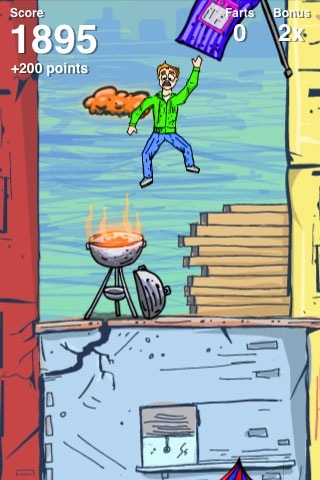 is a comedy game that brings top shelf kicked-in-the-crotch humor to the iPhone and iPod Touch. Ow My Balls! incorporates gravity simulation, hilarious sound effects and directional acceleration tactics for the utmost in non-realism. Upgrade Your Balls! v1.2 Now Available! It’s time to Upgrade Your Balls! Ow My Balls v1.2 is now available in the App Store. If you already own a copy then you should recieve a free update on your phone. If not, what are you waiting for? The latest version is great! Earn unlimited farts with 150,000 points! We busted our BALLS again on 1.2 and hope you appreciate the improvements! And as always, please let us know if you experience any issues with the game, or if you have suggestions for how to improve it. We always appreciate feedback on My Balls. Let’s celebrate with a double nutshot! We can’t wait to get this out there. Hopefully it’ll be up within a week or two. We’ll keep you posted. Some people e-mailed me asking for more information about the piracy situation. I can’t share our exact numbers, but here’s the overall message. In the first week piracy outpaced sales almost 3 to 1. For every copy sold in the app store, just about 3 were downloaded for free from one of a number of pirate app sites. By the end of the week piracy was starting to slow down while sales held steady, so in the long term I’m guessing this will level out. But at least for now this is a disturbing trend that deserves some analysis. Is the iPhone piracy problem really that bad? When I first looked at these numbers I was sure something was wrong with them. There is no way to get an exact count of sales vs. pirates – it’s an interpreted number. However looking at download counts on popular app pirate sites validated what our internal numbers are showing. Pirates apparently like My Balls. Thinking about it, it actually makes a lot of sense. I’ve heard from many sources that free apps outpace paid apps by almost 10-1. Given the pirate marketplace is free, you’d expect a big multiplier here. In addition, the pirate download sites are a more level playing field; unlike the App Store where the highlighted apps are either hand-picked by Apple or have extraordinary sales, on the pirate sites every app is at the same level. So is this good or bad for the game? Remember that the goal of the game was to make people laugh. Whether you’re a pirate or a scallywag you’re still probably going to laugh when you see Joe get kicked in the balls. So in the grand scheme of things, with humor as the goal, this doesn’t really matter. But let’s be frank, sales are important. To continue developing out this game we need revenue. However I don’t think that piracy really hurts there either. The people stealing the game probably wouldn’t have paid for it in the first place, but maybe they’ll show it to a friend who will pay for it. On some metaphoric level, there is something really bad about this. Imagine if a farmer brought 1000lbs of nuts to a local supermarket for sale. The farmer comes back to collect his income a week later and the store says “Hey, here’s the money for 250lbs of nuts. We’re sorry but people stole the other 750lbs.” This would never fly. But this is software, not nut farming, and the dynamics just aren’t the same. So in summation, it’s probably not a bad thing that all this theft is happening. I’m more bitter about the fact that I had to spend an extraordinary amount of time dealing with the Apple code signing system which is designed in part to prevent piracy. For the days of time I spent dealing with code signing issues, this comes back as a big kick in the balls. So lets serve one back up to the app pirates of the world… this is in thanks for your support of independent developers. ARRR PIRATE NUTS! For more insight on iPhone piracy and how to prevent it, check out this article. iPhone Savior – Ow My Balls! is Totally Ridonkulous! Frapstr – Ow My Balls! US is dominating sales with Brittan in a distant 2nd. Copies have been sold in 14 different countries. Of 23 reviews we have 22 that are 5 stars – only 1 that is 3 stars. That is extraordinary for a new app. The day has finally come. Ow My Balls! is now available in the App Store. We’re excited to finally get this out to everyone after almost two months of waiting. Go grab yourself a copy today and support My Balls! Get Ow My Balls Now! And now, without further adieu, the only thing funnier than the game itself – our promo video. Enjoy! Thanks again to everyone who helped us along the way. My Balls will be in your hands shortly. Just waiting for the iTunes Store to update. In the meantime, why not enjoy another great nutshot video? I have to say, this is one of the best I’ve seen. And I’ve seen a lot of nutshot videos. This post goes out to Tim, the Right Nut of Ow My Balls! Tim was responsible not only for the idea for the game but all of the artwork, the website, and the promo video. The game is what it is because of him. Today Tim departs for Asia for a year. We had always expected to have the game out in the store long before he left. Sadly it didn’t happen. So while we patiently wait for 1.0.1 to be approved, the team has now been reduced to one nut. It didn’t stop Lance Armstrong, and it won’t stop us either. How about another YouTube Nutshot video to help pass the time while we wait for approval? This one is wicked … pole vault, to the nuts! What a day. Got off a plane here in Seattle to an inbox flooded with e-mails about the game. Dr. Macenstein broke the story with the first review of the game. We got a GREAT review over at iPhone Savior. And the comments on the forum over at touch arcade.. wow. There’s nothing like having your balls compared to Lord of the Rings. Maybe My Balls are more stable than we thought? While we’re waiting for Apple to approve the update to “Ow My Balls!” we’re going to give away copies of the current version to the first 10 people who send us an e-mail at info@owmyballsthegame.com. So if you’re really anxious to get the game drop us a line and we’ll send you over a promo code. Update: We have our 10 winners! We still have a few codes left, so if you still really want one send us an e-mail. "Ow My Balls!" is a hilarious new downloadable game for the Apple iPhone and Apple iPod Touch platforms.